Your ad appears in the NaturalNews email newsletter. Banner appears above-the-fold in the center column of each article page. Please contact NaturalNews.com for availability. Banner appears below article text on each article page. Please contact NaturalNews.com for availability. Banner appears in the right column of each article page. Please contact NaturalNews.com for availability.
" I highly recommend Natural News email and display ad advertising. I initially purchased THREE MONTHS worth of email advertising and it was paid for in less than 2 days! The sales literally doubled the first two weeks. The display ads are also pulling nicely. But it is not fair to judge the response by the "Click-sale conversion rate" because our customers buy over and over again. In reality, the ads are really priceless. Consider what a customer is worth to you over the course of just one year, and you will be amazed with the response you get from Naturalnews.com. Don't walk, but RUN to your fax machine and get your ads into them. Just do it!! You will be amazed at the results because the NaturalNews.com subscribers and visitors are wonderful people looking for quality products." 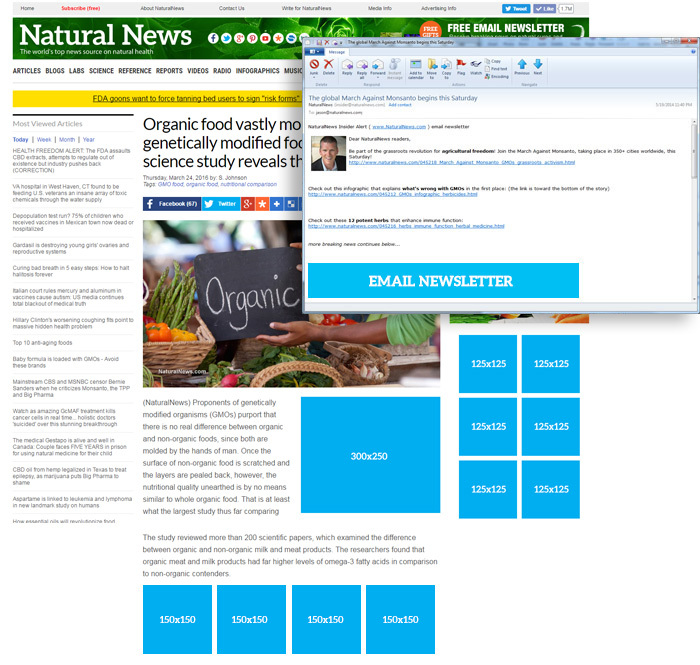 "We currently advertise with NaturalNews Insider Newsletter, and we have had an amazing response! Our sales over the weeks we advertise in the newsletter have been phenomenal. We receive hundreds of hits on our website, which other web sites have only promised, but never delivered. In fact, the most hits we have ever had on our website (over 1000 unique visitors), were from the weeks we advertised in the NaturalNews Newsletter. Not only do people visit our site when they read the newsletter, but they are open to purchase after their questions are answered. All in all, the money spent to advertise came back to us very quickly, and we have decided to continue to advertise in the newsletter for many years to come and are glad to support the work of the Health Ranger!" " I highly recommend Natural News TV banner advertising. It has doubled our website traffic and the people coming from Natural News are wonderful! We started with one banner, then went to two and now will be advertising on Natural News.com as well starting next month. The response has been very exciting. Advertising with Natural News can literally turn your business around overnight!